SaniGuard® Antimicrobial Total Release Area Fogger is a handy disinfectant that is safe for use in all areas. SaniGuard sanitizes entire rooms and vehicles in just 15 minutes. Simply release the fogger, leave the room or the vehicle, and then safely return to a sanitized environment in just 15 minutes. Unlike conventional cleaning, SaniGuard Fogger reaches and penetrates every nook and cranny and is safe for use on all surfaces, even fabrics and electronics. Use SaniGuard to help prevent transmission of germs in offices, hospitals, classrooms and anywhere else germs and bacteria pose a threat to patients, students, employees, animals or clients. SaniGuard even sanitzes HVAC ducts! Simply release the SaniGuard fogger near the duct intake and leave the room. Come back 30 minutes later and the job is done. 8-oz. 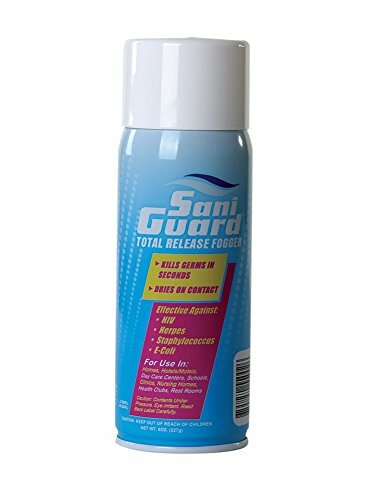 SaniGuard fogger treats up to 625 square feet in one application. If you have any questions about this product by Saniguard, contact us by completing and submitting the form below. If you are looking for a specif part number, please include it with your message.